Everett is the county seat and largest city in Snohomish County, Washington. It has a population of over 103,000 people, making it one of the top five largest cities in the Puget Sound region, as well. It is located on Possession Sound, which connects the Puget Sound to Port Susan, and is about 25 miles north of Seattle. Everett is home to the West Coast’s largest public marina, part of the Port of Everett which is also a commercial port. Just next to the marina is Naval Station Everett, the homeport of a Navy carrier strike group. 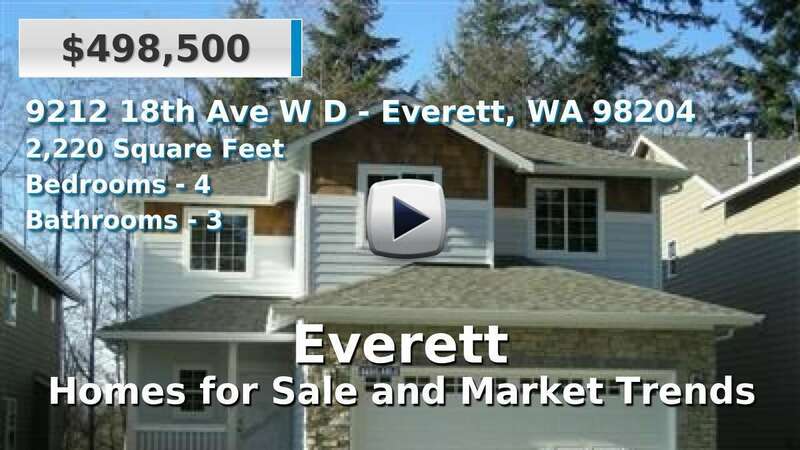 Military families and civilian residents alike live in one of Everett’s 19 neighborhoods, most of which are mainly residential. The current market offers a nice mixture of single-family, condominiums and newly constructed homes for sale, located within a convenient commute to the Seattle metro area. 3 Beds | 2.25 Baths | 2722 sq. Ft.
2 Beds | 1 Baths | 1803 sq. Ft.
3 Beds | 2.5 Baths | 2659 sq. Ft.
3 Beds | 1.75 Baths | 1456 sq. Ft.
3 Beds | 2 Baths | 1996 sq. Ft.
3 Beds | 2.5 Baths | 1261 sq. Ft.
3 Beds | 2 Baths | 1054 sq. Ft.
3 Beds | 1.75 Baths | 2112 sq. Ft.
3 Beds | 2.25 Baths | 1374 sq. Ft.